The C.710 were a series of fighter aircraft developed by Caudron-Renault for the French Arm�e de l'Air just prior to the start of World War II. One version, the C.714, saw limited production, and were assigned to Polish pilots flying in France after the fall of Poland in 1939. A small number were also supplied to Finland. The original C.710 model was an angular design developed from an earlier series of air racers. One common feature of the Caudron line was an extremely long nose that set the cockpit far back on the fuselage. The profile was the result of using the 336 kW (450 hp) Renault 12R-01 12-cylinder inline engine, which had a small cross section and was fairly easy to streamline, but very long. The landing gear was fixed and spatted, and the vertical stabilizer was a seemingly World War I-era semicircle instead of a more common trapezoidal or triangular design. Armament consisted of a 20 mm Hispano-Suiza HS.9 cannon under each wing in a small pod. The C.710 prototype first flew on 18 July 1936. Despite its small size, it showed good potential and was able to reach a level speed of 470 km/h (292 mph) during flight testing. Further development continued with the C.711 and C.712 with more powerful engines, while the C.713 which flew on 15 December 1937 introduced retractable landing gear and a more conventional triangular vertical stabilizer. The final evolution of the 710 series was the C.714 Cyclone, a variation on the C.713 which first flew in April 1938 as the C.714.01 prototype. The primary changes were a new wing airfoil profile, a strengthened fuselage, and instead of two cannons, the fighter had four 7.5 mm MAC 1934 machine guns in the wing gondolas. It was powered by the newer 12R-03 version of the engine, which introduced a new carburettor that could operate in negative g.
Other projected versions were the C.720 trainer with a 75 or 164 kW (100 or 220 hp) engine, the C.760 fighter with a 559 kW (750 hp) Isotta-Fraschini Delta engine, and the C.770 fighter with an 597 kW (800 hp) Renault V-engine. None of these reached production. Deliveries did not start until January 1940. After a series of tests with the first production examples, it became apparent that the design was seriously flawed. Although light and fast, its wooden construction did not permit a more powerful engine to be fitted. The original engine seriously limited its climb rate and maneuverability with the result that the Caudron was withdrawn from active service in February 1940. In March, the initial production order was reduced to 90, as the performance was not considered good enough to warrant further production contracts. Eighty were diverted to Finland to fight in the Winter War. These were meant to be flown by French pilots. However, events in France resulted in only six aircraft being delivered, and an additional 10 were waiting in the harbour when deliveries were stopped. The six aircraft that arrived were assembled, tested and given registrations CA-551 to CA-556. The aircraft were found to be too unreliable and dangerous to use in Finnish conditions, and were not committed to combat. Two of the aircraft were damaged during a transport flight to Pori. Further, the Finnish pilots found that it was difficult to start and land the aircraft from the air bases at the front. The Finnish CR.714 aircraft were permanently grounded on 10 September 1940, and taken out of service in 1941. On 18 May 1940, 35 Caudrons were delivered to the Polish Warsaw Squadron, the Groupe de Chasse polonais I/145, stationed at the Mions airfield. After just 23 sorties, adverse opinion of the fighter was confirmed by front line pilots who expressed concerns that it was seriously underpowered and was no match for contemporary German fighters. On 25 May, only a week after it was introduced, French Minister of War Guy la Chambre ordered all C.714s to be withdrawn from active service. However, since the French authorities had no other aircraft to offer, the Polish pilots ignored the order and continued to fly the Caudrons. Despite flying a fighter hopelessly outdated compared to the Messerschmitt Bf 109E, the Polish pilots scored 12 confirmed and three unconfirmed victories in three battles between 8 June and 11 June, losing nine in the air and nine more on the ground. Interestingly, among the aircraft shot down were four Dornier Do 17 bombers, but also three Messerschmitt Bf 109 and five Messerschmitt Bf 110 fighters. The Caudron fighter was also used by the Polish training squadron based in Bron near Lyon. Although the pilots managed to disperse several bombing raids, and although they did not score any kills, they did not lose any machines. By the end of June when France fell, only 53 production machines had been delivered (although the number varies, 98 is another common figure). Despite a larger number being diverted to Finland, only six Caudron C.714s were received in a semi-assembled state. An additional 10 were on the dockside at the time of France's Armistice with Germany, subsequently, further shipments were halted. After assembly, operations in Finland were limited to test flights and, in September 1941, combat flights with the fighters were prohibited. The aircraft were maintained on the roster until they were retired and scrapped on 30 December 1949. One example, CA-556 was transferred to the maintenance personnel school as an instructional airframe. 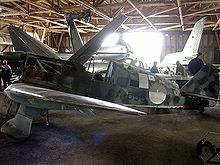 One full CR.714 airframe as well as one additional fuselage were preserved in Finland. The fuselage was offered back to the Mus�e de l'Air et de l'Espace where it is currently undergoing restoration. Belcarz, Bartłomiej. GC 1/145 in France 1940. Sandomierz, Poland/Redbourn, UK: Mushroom Model Publications, 2002. ISBN 83-917178-1-X. Breffort, Dominique and Andr� Jouineau. French Aircraft from 1939 to 1942, Volume 1: from Amiot to Curtiss. Paris: Histoire & Collections, 2004. ISBN 2-915239-23-1. Gretzyngier, Robert and Wojtek Matusiak. Polish Aces of World War II. Oxford: Osprey Publishing., 1998. ISBN 1-85532726-0. Keskinen, Kalevi, Kari Stenman and Klaus Niska. 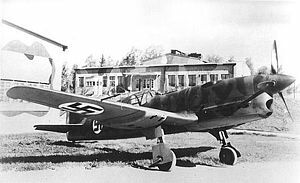 Suomen Ilmavoinen Historia 4: Morane-Saulnier M.S. 406/Caudron C.714 (in Finnish). Helsinki, Finland: Tietoteos, 1975. ISBN 951-9035-19-2. Caudron C.714 Pictures and Caudron C.714 for Sale.